AmaWaterways introduced a new itinerary package in 2018 for tourists wanting to explore the sights of France, Germany and Switzerland via romantic river of Rhine and the serene water of Main River. For the Nov 15, 2018 departure, aboard the AmaDante, they are now offering 2 for 1 cruise pricing on the cruise only rates. With discounted pricing starting at $1949 + $168 port tax for a cabin on the middle deck with a French Balcony, this is a great opportunity to experience this great cruise line. This new AmaWaterways Itineraries package is called the Medieval Treasures. It is a 7-night cruise from Basel to Nuremberg. It promises a plethora of medieval treasures that you will remember for the rest of your life. So, bring your family with you and take a journey of a lifetime. Prepare for your cruise and meet your co-passengers. There are two ways to explore the city – walk or take a bike tour. Explore the iconic structures of Parc de l’Orangerie, the Place de la République, the European Parliament and the famous, fairy-tale like district called “La Petite France”. A guided walking tour will take you to Germany’s old city. Explore Europe’s biggest Romanesque cathedral which is declared as UNESCO World Heritage Site. Enjoy Altpörtel, Speyer Technical Museum and Mannheim Baroque Palace. As the day ends, cruise will take to Rüdesheim for special wine tasting in Riesling. There are many choices to explore the place. Ride a gondola to reach Niedelwald Monument and enjoy the sights vineyards along the riverbanks. If you love music, visit the famous Siegfried’s Mechanical Musical Instrument Museum which houses the grandest collection of self-playing instruments. A whole-day excursion to the medieval city of Heidelberg situated in Neckar River Valley in the Castle Road is another option. Afterwards, end your day tour by visiting the panoramic city views of Frankfurt, the capital of Germany. Have a taste of authentic flavors of Römerberg beer. Miltenberg is known as the “Pearl of the Main River”. It will bring you to a fairytale world as you roam around its 14th and 15th century gabled, semi-timbered houses. Find the famous Crooked House and explore the Royal Inn which is operational since 17th century. Never miss the chance to take photos. These fabled structures are treasures to be remembered. Other options included guided bike tour along the riverbanks of Main River or have a gastronomic trip to Franconia specialties. It is located along Germany’s “Romantic Road” amidst vineyards of the region. It is a beautiful place with Baroque structures and architectural designs. 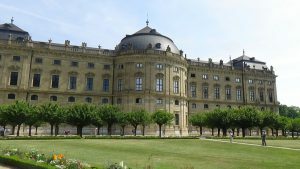 Its crown jewel is the UNESCO World Heritage Site Baroque Residenz Palace. The structure boasts of gran fresco by Tiepolo and lavish interiors which is truly breathtaking. Hike and explore the prominent landmark of the area, the Marienberg Fortress along the left Main River bank. Your afternoon delight can include visiting the famed wine cellars underneath Würzburg and participating in Franconian wine-tasting activity. Bamberg is another UNESCO World Heritage Site. Be enchanted by its numbers of elegant mansions, Old Town Hall and the Cathedral. While roaming, taste their smoked beer and Hornla (a pastry dating back 1427) and the licorice rot. Your new AmaWaterways itineraries journey ends here. But remember, every journey has an end but the memories of experiencing the treasured journey will be forever etched in your heart. This entry was posted in AmaWaterways, Germany, River Cruise & Barge Specials and tagged 2 for 1 River Cruise, Affordable River Cruise, AmaDante Ship, Amawaterways, europeanbarging, Main river cruise, Medieval Towns in Germany Cruise by Jan European Barging & River Cruises. Bookmark the permalink.